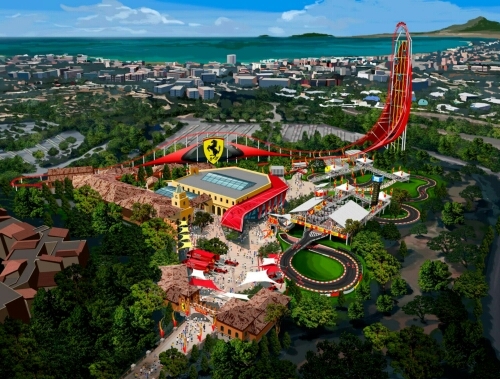 PortAventura will be home to the second Ferrari theme park in the world when it opens in 2016. It could also be home to the world’s tallest launch coaster when it opens, if rumors are true. The Spain theme park, just outside of Barcelona, was announced in 2014 with only a few details. Now we get a few more details as the park is ready to break ground, specifically about the park’s signature attraction. How tall will it be, and how long will it hold the title of world’s tallest coaster? The park hasn’t officially announced the new coaster yet, and is expected to do so around May 7th. The coaster will reportedly be about 140 meters, or 459 feet. That puts it taller than the current world record holder, Kingda Ka at Six Flags Great Adventure in New Jersey. Kingda Ka currently holds the crown as the tallest coaster, measuring in at 456 feet. This new coaster will squeak by with just three feet to spare. There is no word on how fast the new coaster will be, but you’d have to guess that it would also be faster than Kingda Ka’s 128 mph. Kingda Ka once also held the record for the world’s fastest coaster, clocking in at 128 mph, but another Ferrari park-Ferrari World in Abu Dhabi, smashed that record with their coaster-Formula Rossa. Formula Rossa clocks in at 149 mph. Of course, the record for the World’s Tallest Coaster will be short lived. In 2017, Skyscraper at Skyplex Orlando is scheduled to open the 570 foot tall Polercoaster. However, the Ferrari Land coaster will hold on to the title of the World’s Tallest Launch coaster. This is still a rumor, as it hasn’t been officially announced by the park, but we should learn more very quickly as the coaster is expected to break ground in a ceremony with park management and community leaders. Stay tuned for more from Ferrari Land, and be sure to get social with us on Facebook, and follow along with us on Twitter @BehindThrills for the latest updates! For more information about PortAventura’s Ferrari Land, including tickets, visit the official website by clicking here!